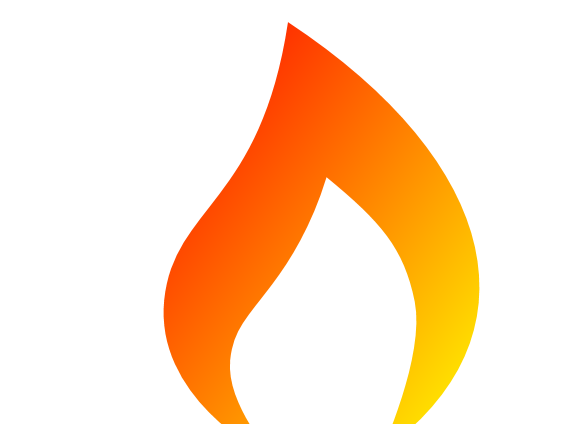 • Type of Fuel – This will obviously depend on which types of fuel are available in the area and although the vast majority of UK homes have a gas supply, those in remote areas may have to rely on oil, LPG, Solid Fuel or renewable energy such as solar. • Boiler Size – It may seem obvious that the size of the central heating boiler (in terms of its output) will need to reflect the needs of the household in respect of how many radiators it has to warm and the demand for hot water, but the space available will also dictate the physical size of the boiler which can be installed. 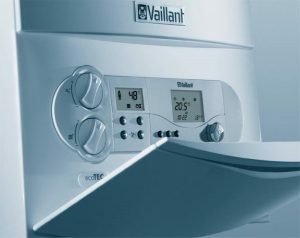 • Household Requirements – A combi boiler which heats water as it is required may be acceptable in a small house or flat where the demand for hot water is relatively low but it would be unsatisfactory in a large household where several occupants may wish to use hot water at the same time. 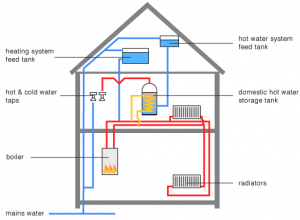 • Renewables – The inclusion of renewable sources of heat energy in a domestic central heating system can affect the type and size of boiler to be installed as there would be normally more than one type of energy used. Since 2005 Building Regulations require that newly installed domestic central heating boilers are ‘A’ Rated for energy efficiency. This means that they need to be at least 90% efficient at converting the type of energy they use (gas, oil or LPG) into heat energy. Condensing boilers, by re-using heat that would otherwise be lost, are the only type of central heating boilers available which can meet this efficiency level. Compared to traditional central heating boilers condensing boilers also have lower emissions of potentially harmful gases. That is important because about a quarter of all UK carbon dioxide emissions and a third of all carbon monoxide emissions are generated from domestic properties. So how do condensing boilers work? 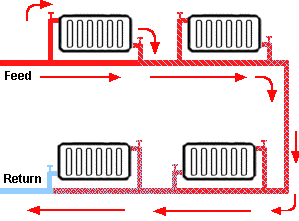 In central heating boilers fuel is burnt to create heat within a combustion chamber which in turn heats up the water travelling through a system of pipes in a heat exchanger. In older boilers as much as 40% of that heat is lost together with waste gases as they pass through the flue to the outside. This is evidenced by the external flue of a non-condensing boiler getting so hot that it requires a protective metal cage around it. In condensing boilers some of this otherwise lost heat is used in a second heat exchanger to pre-heat water coming back from radiators so that the main heat exchanger doesn’t have to work so hard. This means that the central heating boiler works more efficiently and less gas is used, resulting in lower emissions. As a result, the temperature of waste gases leaving a condensing boiler are around 50-60oC compared to 120-180oC in a non-condensing boiler. When hot gas within the combustion chamber gives up its heat to the secondary heat exchanger it naturally cools down, creating water vapour and mildly acidic water known as condensate. 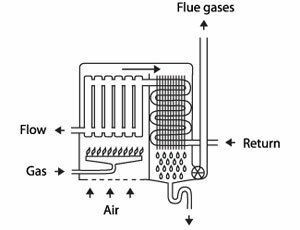 The heavy flue gases require a fan-assisted flues to emit them and the acidic condensate is drained from the boiler via a pipe into a drain. 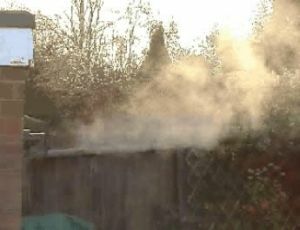 Flue gases emitted on a cold day will form a mist or plume of water vapour. A combi boiler (or combination boiler) combines several functions of a traditional central heating system which would otherwise need an external pump, cold water tank and hot water storage tank. A combi boiler provides heat for radiators, and domestic hot water is supplied ‘on demand’. When a hot tap is turned on water is immediately taken from the mains supply and heated in the boiler before being fed out of the tap. The all-round functionality, relatively easy installation and lower cost make combi boilers the best-selling type of domestic central heating boiler in the UK. • Combi boilers are more economical to install and use for smaller households than other types of domestic central heating boiler. • A combi boiler provides on-demand heat for radiators and hot water at the taps so there is no need to wait for a hot water cylinder to refill. 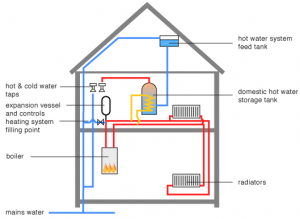 • With a combi boiler, no energy is wasted storing hot water in a hot water cylinder. • A combi boiler is fed directly from the mains supply which means that there is drinkable water at every tap. It also removes the need for a cold water tank and all the associated piping. • Combi boilers are unsuitable for large homes where multiple sources of hot water are required at the same time. Maximum water pressure is only available at one tap at a time. • With a combi boiler there can be a delay in hot water being fed out of a tap as it needs to be heated up first. • If hot water stored in a tank or cylinder is allowed to go cold, more energy is required to heat it up again. • A flow test is required before a combi boiler can be installed to ensure that mains water pressure meets the necessary requirements. • Not all types of showers (such as power showers) are compatible with a combi boiler, though you could run a fairly powerful shower off the bath taps with a combi boiler. • Because there is no hot water cylinder with a central heating system fitted with a combi boiler there can be no back up hot water supply from an immersion heater. Heat only boilers were used in most traditional domestic central heating systems and the vast majority of homes built in the UK prior to 1970 would have had heat only boilers. As well as providing heat for radiators directly, they produce hot water which is then stored in a separate hot water cylinder, usually in an airing cupboard. Cold water is supplied directly from the mains to a cold water cistern normally in the loft so that it can feed water to the central heating boiler by gravity. • Heat only boilers are suitable for larger households where there may be simultaneous demands for hot water from the occupants. • With a heat only central heating boiler, several hot water taps can be used at the same time due to the storage of hot water in a hot water cylinder. • Heat only boilers are easy to change in traditional central heating systems without much alteration to existing pipework. • Heat only boilers are easy to maintain due to their relatively simple design. • Heat only boilers can be used where mains water pressure is low. • Heat only boilers take up more space than combi boilers due to the need for a hot water cylinder and external pump. • With a heat only boiler, a hot water cylinder is required to store hot water and unless it is well insulated the water will cool, requiring it to be re-heated. 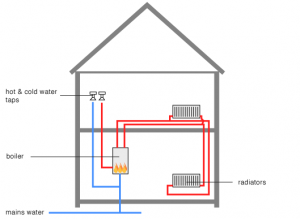 Heat loss can also occur from the hot water pipes. • Although there is a ready store of hot water it is limited by the size of the storage tank and a heat only boiler will not heat water up as quickly as a combi boiler so you could be waiting for the hot water cylinder to refill. A system boiler works on the same principle as a traditional heat only boiler but many of the major components such as pumps and expansion vessels are built within the boiler rather than being separate to it. It is therefore sometimes referred to as a sealed system. • With a system boiler here is no need for a feed and expansion tank in the loft. 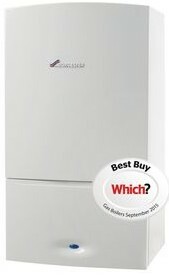 • System central heating boilers can be used with pressured cylinders, in which case you wouldn’t need a cold water tank. • The pump is inside a system boiler which means that it is more responsive and therefore more economical to run. • One water flow pipe serves all of the radiators progressively resulting in a gradual reduction in the temperature of the water in the pipe as it travels around the house. • It is more difficult to control heat distribution around the house with a one pipe system. • One pipe systems are old fashioned and only currently used for very small central heating installations. • The installation of a new ‘A’ rated condensing boiler into a property with a one pipe system will require new pipework to transform it into a two pipe system. • The water heated by a boiler is fed to radiators through one pipe whilst cooler returns from each radiator through another pipe. 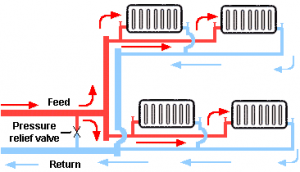 • A more even temperature can be created in all radiators with a two pipe system than with a one pipe system. 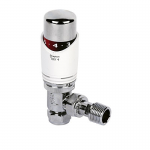 Thermostatic radiator valves have a built-in air temperature sensor so that they can be used to control heat output from a radiator by adjusting the water flow through it. This allows the temperature of each room to be separately adjusted and controlled and can be a major contributory factor in reducing energy usage, especially by turning down radiators in unused rooms.